Biddy is totally off grid with solar lighting and a gas cooker so come with your phones and cameras fully charged. Even better, forget your phone for a while and really escape. There is no television, which lends nicely to playing cards or a board game, reading from the library, listening to the antique battery radio and then snuggling up outside with the duvet under a starry sky on the old wrought iron bed. Biddy is located 8km north of Masterton on our family farm. She is 7.5 metres long (which happens to be the greatest length that a kangaroo can jump) so ample room to leap about. From your armchair you have a beautiful view over the farm and from your bed you look out at the mountains. Standing on the front steps you can see the Loopline Vineyard and just beyond the old red barn is Paper Road Vineyard which offers casual drinks, dining and pizza nights. Loopline Olives welcome visitors for oil tastings and only 15 minutes up the road is the Pukaha Mt Bruce National Wildlife Centre where you can get to see the white kiwi. This is a wonderful opportunity to experience glamping. Bring along your favourite coffee for using in the plunger and keep your beverages cool in the icebox. 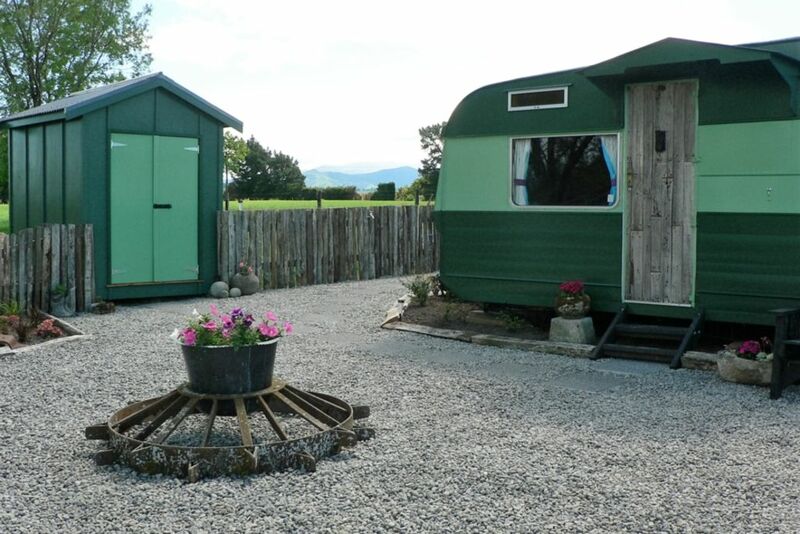 The bathroom has a hot gas shower and the caravan is kept cosy with a gorgeous wee coal stove. We provide your linen and towels. Amazing little caravan filled with thoughtful touches. Complete privacy and solitude but only 10 minutes drive from Masterton. Highly recommended- we will certainly be going back. A Magical Slice of Heaven! What a magical little place with fantastic little details right down to the star bunting and fresh cut dahlias inside! The star gazing was spectacular and the peace and tranquility just what we needed. Thanks you so much! Highly recommend this little piece of paradise!! We loved staying in Biddy, we especially loved star gazing in the evening - it was magical. If you like adventure, peace and quiet all at the same time you will love Biddy. Just the cutest wee gem.